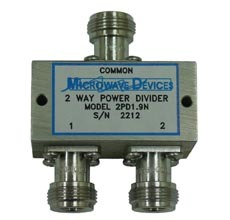 Microwave Devices standard line of 2-way RF power dividers/combiners provide superior performance and power handling capacity, covering frequencies from 3 kHz up to 40 GHz. Custom units are also available with performance specifications tailored to suit your requirements. Standard connector configuration is female connectors at all ports. Consult factory for custom configurations. Higher isolation units, custom frequency ranges and power levels up to 1500 Watts are available. Consult factory.